George Ferrandi's work has been performed or exhibited at the International House of Japan in Tokyo, Abrons Arts Center in New York City, the Kitchen in New York City, Cinders Gallery in Brooklyn, Sluice Art Fair in London, the McKinney Avenue Contemporary in Dallas; the Wexner Center for the Arts in Columbus, Ohio; the Samuel P. Harn Museum of Art in Gainesville, Florida; and the Fleisher Art Memorial in Philadelphia. She has received grants from the Franklin Furnace Fund for Performance Art, and the Mid Atlantic Arts Foundation. 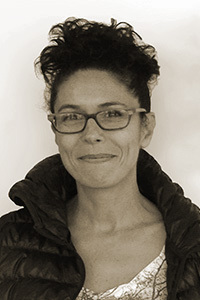 Ferrandi is the director of Wayfarers Studio Program and Gallery and is a regular collaborator with The Yes Men. Ferrandi teaches Sculpture and Performance Art periodically at Pratt Institute, Virginia Commonwealth University, and the Rhode Island School of Design.